Arguably the most audacious feature of an Apollo flight was to have the crew re-enter Earth's atmosphere in the manner that they did. In the final minutes of a mission, a lump of metal and plastic, three crewmen and a few dozen kilograms of moonrock, altogether weighing nearly 6 tonnes, came barrelling in from outer space as Earth's gravity hauled it in at speeds approaching 11 kilometres per second. As it entered, the air in front of the blunt end of the command module was brutally compressed in a shock wave, generating temperatures approaching 3,000°C. 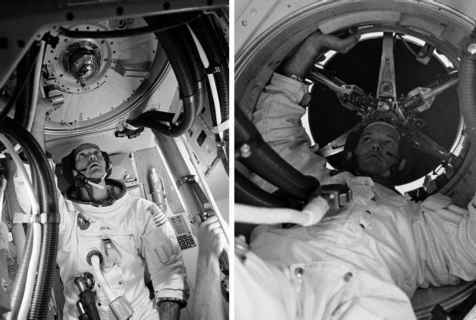 All that stood in the way of the crew being incinerated by this extraordinary heat was a coating of resin and fibreglass that NASA's engineers reckoned could withstand the punishment. In truth, the heatshield that surrounded the Apollo command module was very conservatively engineered for two main reasons. When the spacecraft's design was frozen, engineers still had a poor knowledge of how the superheated air of re-entry would flow around the upper walls of the spacecraft, the part that did not bear the brunt of the heat, and they decided to cover almost the entire surface with the heatshield material. Additionally, the original specifications had required the shield to tolerate a much longer flight through the atmosphere, 6,500 kilometres, than was ever necessary. The command modules that returned from the Moon typically flew for only about 2,200 kilometres through the atmosphere, nearly halving the overall amount of heat the shield had to endure. In practice, although the heatshield took a lot of punishment across its curved aft section, much of its conical surface was barely singed by re-entry. Even the reflective Kapton tape that had been glued to the spacecraft's exterior for thermal control in space was usually found to be still adhering to much of the hull. On recovery, pieces of Kapton were occasionally peeled off by those in attendance and kept as souvenirs.